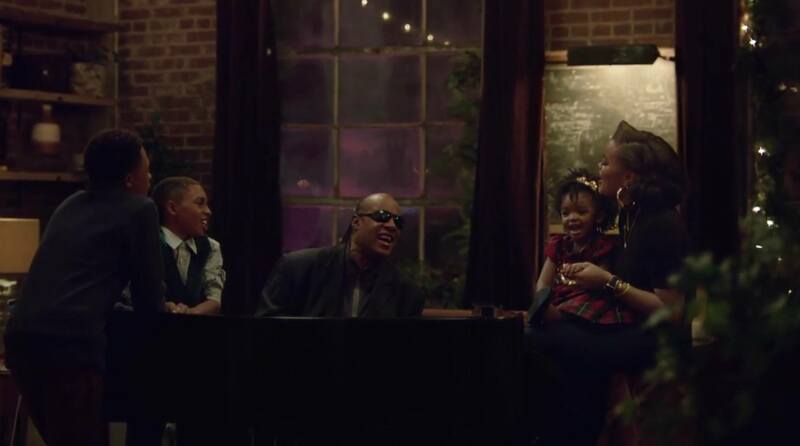 Apple uploaded a new holiday commercial today (just ahead of Thanksgiving in the United States) featuring soul singer Andra Day and Stevie Wonder playing Wonder's 1967 classic 'Someday at Christmas'. The ad is notable for a couple of reasons. First, it's not focused on any particular Apple product, although MacBooks and Apple Watches make a brief appearance. The theme of the ad is Day and Wonder playing and singing together – the ad immediately highlights VoiceOver integration in GarageBand for Mac, one of the Accessibility features that Wonder uses to interact with OS X and manage recorded tracks in the app. Earlier this year, Apple was honored as a recipient of the Helen Keller Achievement Awards for its implementation of accessible technologies, with a particular mention of VoiceOver by the American Foundation for the Blind. In a subtle note, the ad closes to a "Love, Apple" message. You can watch the video below.